. In 1877, Schiaparelli began producing some of history's most iconic planetary maps, and he single-handedly invented the naming scheme we use to identify features on Mars today. His maps are famous for their detail and beauty, as well as for showing many linear features he named canali (the Italian word for channel). 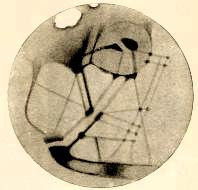 A combination of translation error and overactive imaginations caused some of Schiaparelli's contemporaries, including astronomer Percival Lowell, to re-label these features as canals, suggesting that Mars was home to both an advanced Martian civilization and abundant water bodies. Of course, further study of Mars has revealed neither water bodies nor any signs of intelligent life on the planet, and Schiaparelli's 'canali' were shown to be nothing more than an optical illusion. Yet, our study of the planet has only increased, and our curiosity has only deepened, as countless images and numerous space missions have been dedicated to the Red Planet since Schiaparelli's time. But don't just take my word for it. Instead, you can fly all the way there yourself with Mars in Google Earth 5.0. New features released on Friday give you a glimpse into the evolution of our knowledge of Mars over the course of history. You can travel back in time to see the sketches of early astronomers like Schiaparelli and Percival Lowell in the 'Historical Maps' layer. You can also fast-forward more than a century with the 'Live from Mars' layer to view the latest images from NASA's THEMIS camera on board the Mars Odyssey spacecraft, sometimes just hours after NASA receives them. Bill Nye the Science Guy and Public Radio's Ira Flatow, host of Science Friday, have also recorded narrated tours of Mars — together they'll walk you through some of the most interesting geology in the solar system and show off mankind's most advanced robotic planetary explorers. For more information about the new features added to Mars in Google Earth, check out the Google LatLong Blog, or view the tutorial video below. To explore Mars on your own, download Google Earth 5.0. Today is the 174th birthday of the famous Italian astronomer and cartographer Giovanni Schiaparelli. In 1877, Schiaparelli began producing some of history's most iconic planetary maps, and he single-handedly invented the naming scheme we use to identify features on Mars today. His maps are famous for their detail and beauty, as well as for showing many linear features he named canali (the Italian word for channel).